County Mayo, which is located on the west coast of Ireland in the province of Connacht, had a population at the time of the Great Famine of almost half a million. The haemorrhage of emigration in the past century and a half has reduced the population to a little over one fifth of this figure. However, this emigration has generated a Mayo Diaspora which has resulted in millions of people worldwide who can trace their ancestry back to County Mayo. 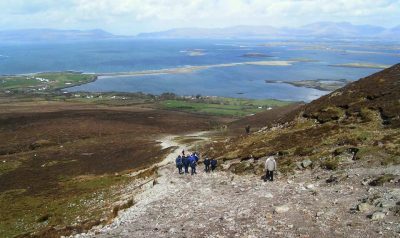 Mayo’s main tourist attractions include the Marian Shrine at Knock and Ireland’s ‘holy mountain’ Croagh Patrick. 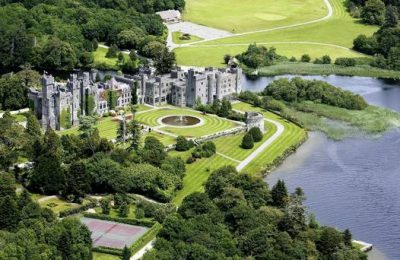 Ashford Castle at Cong where ‘The Quiet Man’ was filmed is well worth a visit as is Westport, said to be Mayo’s most attractive town. The county is famous throughout Europe for the quality of its angling, unspoilt beaches and historic ruins which cover a period of over five thousand years.